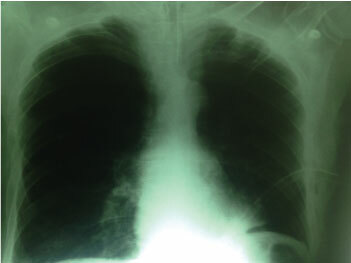 A 66-year-old patient with air flow chronic obstructive who attends the emergency service due to aggravation of his usual restlessness and dyspnea. He recorded multiple admissions in the last year for the same reason, requiring mechanical ventilation and tracheotomy. It enters from the emergency service to the Critical Care Unit poorly perfused, lucid with restlessness, intermittent paroxysmal atrial tachycardia on the electrocardiogram. There is no air intake in both hemithorax. Non-invasive ventilation is attempted, failing a few minutes to try. Endotracheal intubation and mechanical ventilation were decided. In the Rx. Thorax shows an aerial image without vascular arborization in the left hemithorax and is not present in previous radiographs (last radiograph six months ago). Polycultures are performed and a scheme is started with Amoxicillin + Sulbactam. After mechanical ventilation, perfusion improves, and lividness disappears, improving the urinary rhythm progressively. In the ultrasonographic studies we observed a sign of the pulmonary point in the left hemithorax. The heads of service of Pneumonology and Surgery agree on the diagnosis of bulla and the need to perform a chest tomography as they do not inspire confidence in the ultrasonographic study. In our hospital we do not have a CT scanner and should be transferred by ambulance to a private CT scan 15 ' from the hospital. 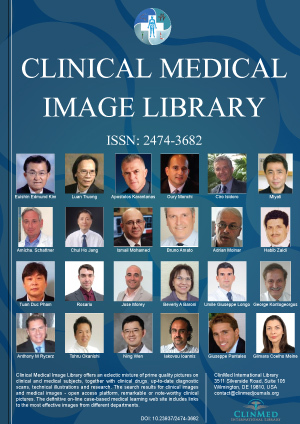 At 24 hours of his hospitalization it was decided to transfer the patient under mechanical ventilation to a private center of images due to the persistence of the pulmonary point in the successive ultrasonographic studies performed in the patient. The tomographic study consisted of left partial pneumothorax with displacement of the	mediastinum. Chest drainage was placed, favorably evolving the patient, being discharged on the 10th day of hospitalization. The Video 1 and Video 2 show in the longitudinal cut of the left hemithorax at the level of the 2° left parasternal intercostal space and at the level of the anterior axillary line lack of sliding of the visceral parietal pleural interface and lines A below it, suggestive of the presence of pneumothorax. In the remaining Video 3, Video 4, Video 5, Video 6 and Video 7 all show the two-dimensional image of lack of sliding of the pleural interface, but with the presence of it in the proximity of the same according to the respiratory movements, suggestive of the presence of the pulmonary point. Below the two-dimensional images we observe in the M mode the confirmation of the pulmonary point, since according to the respiratory movements at one point the two pleural leaves adhere (sign of the beach) during inspiration, whereas at the expiration the pleural they are separated again by documenting in the M mode the sign in bar code, compatible with the presence of pneumothorax. 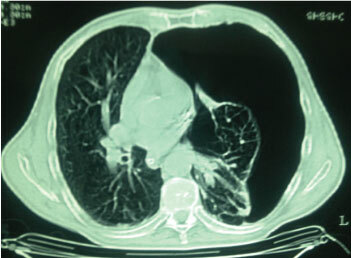 In the chest X-rays of the patient, one of them obtained in the emergency service and the other on admission to the Critical Care Unit, there is no arborization vascular in the lower left field, an image diagnosed as a giant bulla by the specialist in imaging, Pneumonologist and surgeon (Figure 1). In the first two tomographic cuts the presence of pneumothorax is evident, in the third cut the presence of contact of both pleura is documented, an ultrasonographic sign called the pulmonary point. In the remaining sections, 4th and 5th same image. 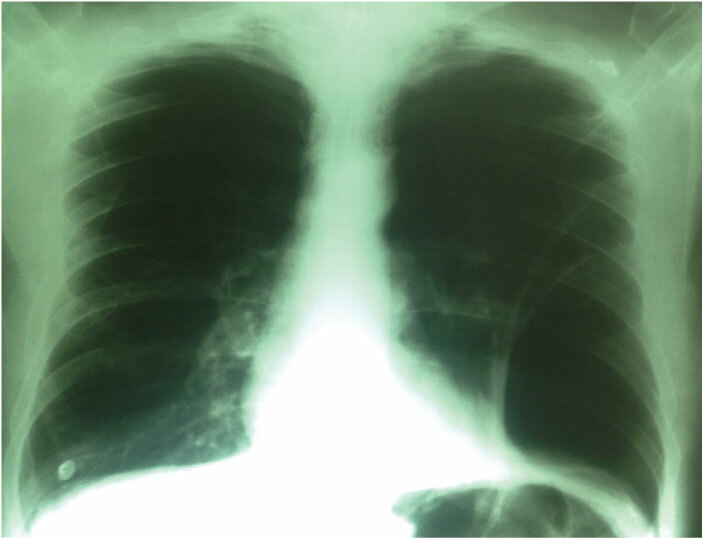 Observe in all tomographic sections the displacement of the mediastinum to the right hemithorax, which may cause tension pneumothorax (Figure 2, Figure 3, Figure 4, Figure 5 and Figure 6). In the last radiograph, pleural drainage tube was observed with the disappearance of the image of absence of arborization in the lower left field observed at its entrance (Figure 7). Figure 1: Chest X-rays of the patient, on admission to the Critical Care Unit. There is no arborization vascular in the lower left field, an image diagnosed as a giant bulla. 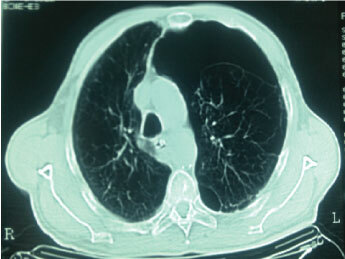 Figure 2: Evident Pneumothorax in left hemithorax. 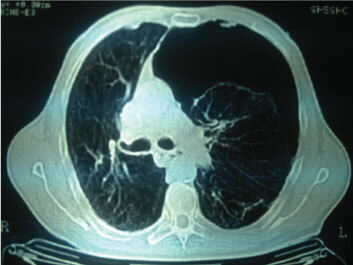 Figure 3: Pneumothorax in the left hemithorax. Figure 4: Neumothorax in the left hemithorax. Observe the presence of contact of both pleura. Figure 5: Presence of contact of both pleura is documented, an ultrasonographic sign called the pulmonary point. 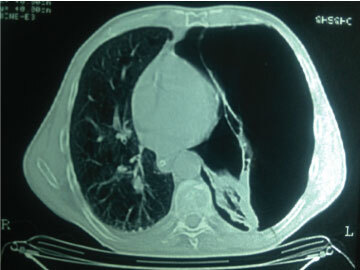 Figure 6: Observe in all tomographic sections the displacement of the mediastinum to the right hemithorax, which may cause tension pneumothorax. 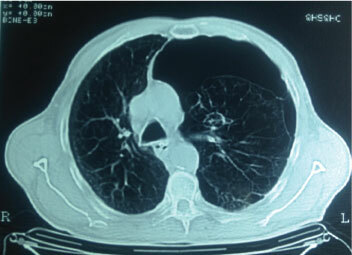 Figure 7: Pleural drainage tube with the disappearance of the image of absence of arborization in the lower left field observed at its entrance. José Luis do Pico, Critical Cara Unit, Hospital Municipal, Necochea, Argentina. © 2019 do Pico JL, et al. This is an open-access content distributed under the terms of the Creative Commons Attribution License, which permits unrestricted use, distribution, and reproduction in any medium, provided the original author and source are credited.